While Movado’s legendary Museum® dial, stunning in its simplicity, and the dial of its new 2012 Skymap™, breathtaking in its intricate, stellar beauty, present two alternate views of the heavens from earth, Movado’s awe-inspiring 2012 Red Label Planisphere™ designs depict three different bird’s eye views of our planet from outer space. Fascinating in detail and mesmerizing in mystique, each graphic black and grey dial presents a meticulously rendered, artist-enhanced photographic image of one of our continents – North America, Europe or Asia – as seen from beyond the earth’s atmosphere. Thin, crisply angled skeleton hands, Movado’s signature concave dot at 12 o’clock, a subtle date indicator subdial at 6 o’clock, and positioned at 10 o’clock, an elegant moon amplification indicator with exquisite photographic image of the full moon at its center add unique touches of design sophistication. MOVEMENT: Mechanical, self-winding Sellita caliber SW300 with Dubois-Depraz DD9235 complication; 21 jewels; custom-designed rotor with red Movado “M” silhouette. 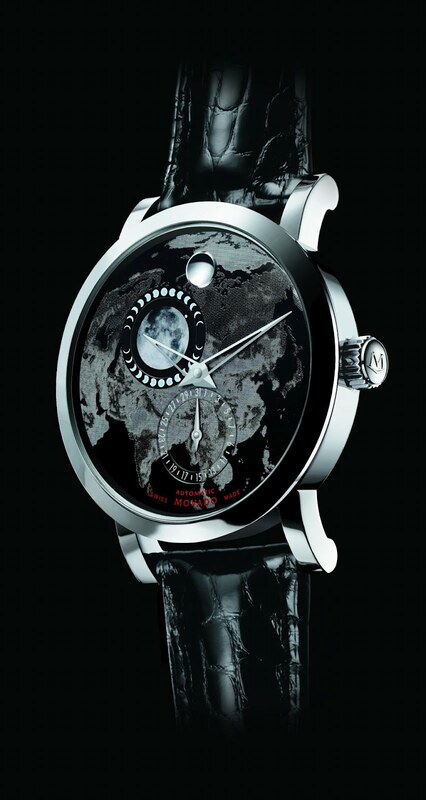 DIAL: Artist-enhanced photographic black and grey image of North America, Europe or Asia viewed from outer space, with date indicator subdial at 6 o’clock, moon amplification indicator at 10 o’clock, silver-toned skeleton dauphine hands, concave rhodium-plated Museum dot at 12 o’clock, red lettering. CASE: Round solid polished stainless steel case with signature embossed “M” crown, sapphire crystal exhibition case-back. Flat, scratch-resistant sapphire crystal. Water resistant to 3 ATM. BRACELET: Glossy black genuine alligator strap with polished stainless steel classic tongue buckle.